A police baton or truncheon (nightstick in American English) is essentially a stick of less than arms-length, usually made of wood, plastic, or metal, and carried by law enforcement, correctional, and security personnel for non-lethal self-defense or combat situations. 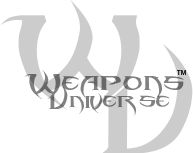 As an impact tool, batons can be used to strike, jab and block and to aid arm locks. They are also employed to break windows, break the safety glass surrounding fire extinguisher enclosures, or lever open doors to gain entry to vehicles or structures. 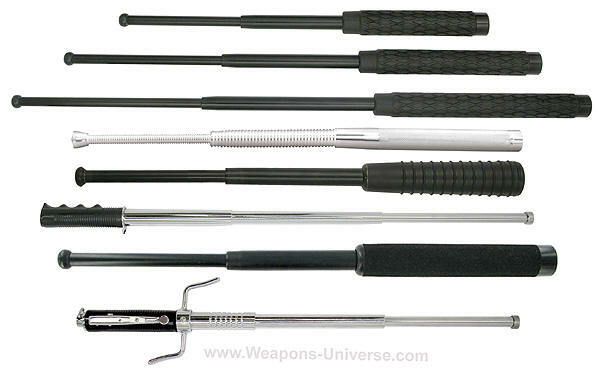 Standard Tonfa Police Baton, 24"
Expandable Baton, Rubber Handle, 16"
Expandable Baton, Rubber Handle 21"
Expandable Baton, Rubber Handle 26"
Expandable Baton, Rubber Handle 29"
Expandable Baton, Rubber Handle 32.5"
Expandable Baton, Foam Handle, 16"
Expandable Baton, Foam Handle, 21"
Expandable Baton, Foam Handle, 26"
Expandable Baton, Foam Handle, 31.5"
LED Light Baton, Rubber Handle, 16"
LED Light Baton, Rubber Handle, 21"
LED Light Baton, Rubber Handle, 26"
Keychain Baton, Chrome Textured 12"
Keychain Baton, Black, Textured 12"
Hi-Tech Baton, Ribbed Handle, 16"
Hi-Tech Baton, Ribbed Handle, 21"
Hi-Tech Baton, Ribbed Handle, 26"
Spring Coil Baton, Chrome, 17"
Spring Coil Baton, Black, 16"
Spring Coil Baton, Black, 21"
Spring Coil Baton, Black, 26"
ASP Batons: Armament Systems and Procedures. S21 Sentry Baton, Friction Loc, 21 in.